Fianna Fáil’s Cheif Whip Seán Ó Fearghaíl has said his party is “reeling and indeed bewildered” by Brian Crowley’s decision to leave the liberal group in the European Parliament and join the grouping that includes British Conservatives and parties described as far right . Mr Ó Fearghaíl told RTÉ’s Morning Ireland the parliamentary party will consider this “extraordinary development” and it will decide how to deal with Mr Crowley’s decision. Mr Crowley was elected as a Fianna Fáil MEP running under the ALDE banner six weeks ago and he has now made a “unilateral” decision to transfer to a grouping in Europe with which Fianna Fáil has “absolutely nothing in common”, Mr Ó Fearghaíl said. 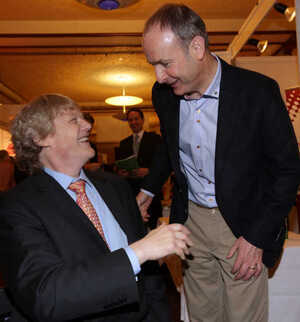 Posted in Misc and tagged Brian Crowley, Fianna Fail, Michael Martin at 10:08 am on June 24, 2014 by Broadsheet.